iPhone 4S battery-gate: is it real? Last year’s iPhone 4 was a big hit, but it came with one huge blunder dubbed “antenna-gate.” The iPhone 4S fixes the reception issue radically and very effectively using a dual-antenna setup and the phone “intelligently” switches between the two for better transmission and reception. But could there be another huge issue lurking to discredit the iPhone 4S incredible initial success? “Battery-gate” as many have already started referring to, stands basically for a very quick drain of the battery on the iPhone 4S. Some users say their year old iPhone 4 has also been affected after the iOS 5 update and many are seeking the root of the problem in constant iCloud syncing, but really the problem doesn’t seem to be effectively solved yet. “I've noticed it too, just overall much worse battery life. The phone also seems to be running hot more often as well. I was hoping that it was some initial syncing or backing up. My Rdio app had to re-sync it's offline collection for example. Very annoying,” the user vish wrote. “The major problem here is that this drain was never this high pre the upgrade to ios5, so I can not blame my corp mail account just yet, but this is realy frustrating as the phone is nothing more then a brick, I expect all things to work for at least a regular 8-10 hour business day,” Andre3G shared on Apple Discussions. We’d love to hear what’s your experience with iOS 5 and whether the issue is really as widespread as it seems, so don’t hesitate to cast your votes in the poll below. We’ll publish the results on Friday, but in the meantime you can also chime in with your detailed experiences in the comments below. Thanks to everyone who mentioned the iPhone 4S battery issue in their comments earlier! 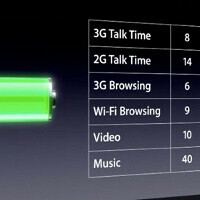 Have you noticed a significant drop in battery life after the iOS 5 update? Yes, I have the new iPhone 4S and it drains battery faster than the Cookie Monster eats cookies. Yes, I’ve update to iOS 5 on my iPhone 4/3GS and the battery life has gotten much worse. I haven’t noticed anything like that. I have an Android/Windows Phone/Symbian/feature phone, so I don’t care. Yes, I have the new iPhone 4S and it drains battery faster than the Cookie Monster eats cookies. Yes, I’ve update to iOS 5 on my iPhone 4/3GS and the battery life has gotten much worse. I haven’t noticed anything like that. I have an Android/Windows Phone/Symbian/feature phone, so I don’t care. I guess that poll so far kind means there is a probkem. I know thats a huge problem with any phone is to have apps or systems constantly checking internet and syncing. I have that problem with android and did with windows mobile if i let it happen. I hope its jyst a matter of tweaking the settings to not start stuff upp as much to sync or what ever. As a 4S user, I honestly have had no issues with the battery. This is my first iPhone so I can't compare to iOS4, but it gets much better battery life than my Droid Pro used to get. "faster than the Cookie Monster eats cookies" LOL its on the OS not the phone. Yes. Good way to weed out the I'll-click-on-anything-since-I-can't-really-relate type of people who'll pick any of the real choices *just because*. I, for one, picked "I'm a ... user, I don't care". Why do the idiots SuperAndroidEvo, or Remixfa never get moderated? They are trolling up and down on this post, and of course it's tolerated. a troll is someone who posts inflammatory,extraneous, or off-topic messages in an online community, such as an online discussion forum, chat room, or blog, with the primary intent of provoking readers into an emotional response or of otherwise disrupting normal on-topic discussion. Maybe it has to do with the new notification system. True multitasking has its negatives. call me when the iphone gets true multitasking. :) no, the difference is, now its syncing things OTA like android where it did not before. All that syncing drains the battery. Its par for the course when syncing is done wrong. You have androids. you know battery can be great or horrible depending on whats running in the background. lol Right? No, no, no, you need to always use the bottom outlet not the top one. If you use the top outlet your phone will drain faster! Gosh don't you know that? Really PhoneArena Team? He & I are having fun. Now there is the troll police? What is going on around here? How have you noticed this? Do you have an iPhone? Ohh I thought I made this clear, just so you know I have received every iPhone ever made on opening day. Remember the company who my Father works for made the Wall Street Journal App. The Wall Street Journal gives my Father's team a free iPhone & iPad when they come out. My Father has no use for it so he gives me the iPhone & gives my younger brother the iPad. So yes I have a 64GB Apple iPhone 4S. You are right on not getting the iPhone 4S, the only difference between your iPhone 4 & the new 4S is the camera. That is all, I see no difference in speed between the iPhone 4 on iOS5 & the iPhone 4S. Siri is fun but I got bored very quickly. The games that will take advantage of the new dual-core 800MHz processor don't exist yet. You are better off waiting for the iPhone 5. One thing I can say though for whatever reason iOS5 drains the battery quicker on the iPhone 4 & the iPhone 4S drains quicker than the iPhone 4. I think it’s a combination of both the dual-core & iOS5. Well I guess to each is own! Those have been my findings. Also my buddy & his girl are both getting worse battery life with the new iOS5 update on their iPhone 4's. Those are 3 separate phones that I know about! I don't think the new notifications opened up full multitasking. It still uses push notifications and has freeze states for apps etc. if it does have to do with synching icloud, i'd imagine theres a setting somewhere to take care of it, and if not, i'd assume a simple ota update would fix the problem easily? just assuming, i know nothing of the iphone personally. Maybe iOS is now trying to be Android that's why they snag some of the features and so as the battery life. Everything I have been reading on iOS sites I follow, indicates a battery issue with the 4S. I suspect it is due to either iCloud synching or... Siri. My bet is on Siri. Siri is a resource-intensive app, and as CPU utilization goes up, so does battery consumption.